My bottle of Creme de Violette finally arrived from Sam’s Wine last Tuesday. I eagerly opened the box and pulled out a bottle of lovely violet colored spirit. The beautiful color is the first and most striking thing you’ll notice about a bottle of Creme de Violette. I admired for only a short time though before I had to break the seal and sample. The smell, and not surprisingly the flavor, are distinctly floral. This is a medium sweet liqueur, a little less sweet than Cointreau for comparison sake. Ok, so enough about the Creme de Violette, you’re here to find out what impact it has on the Aviation. Quite a lot I must say. I started off with Erik Ellestad’s approximation of the original recipe. The resulting Aviation is much less sweet than some of the other recipes that I’ve tried, but at the same time not overly sour which is interesting. In other recipes as the sweetness decreased the drink became quite a lot more sour. I think this flavor profile is a direct result of the addition of a small bit of simple syrup. My big gripe about this recipe was that the flavor of the Maraschino and Creme de Violette were not as present as I would like. So, on the tasting continued with a modification of my prefered non-Violette recipe. I found that the Violette added an entirely new level of complexity in the flavor profile of this drink. The result was nicely floral and exceedingly pleasing. In addition the color of this recipe was absolutely gorgeous. As you can see from the picture above the color is a light violet color that you rarely see in cocktails. Still wasn’t exactly what I was looking for though. I next turned to the second recipe list in Diffords Guide #7. 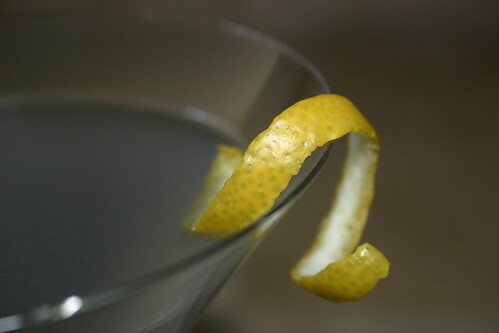 This recipe upped the Violette to 1/2 oz which sounded appealing but lowered the lemon juice to only 1/2 oz as well. As with the others the color is very striking, really in love with the look of this cocktail. The aroma of the Violette comes through very nicely. Although the Violette is the primary background flavor the Maraschino is still there as well. This recipe has the perfect level of sweetness in my mind but due to the cut in the lemon juice the sourness isn’t where I’d like. So where do all of these experiments lead us? Well, I enjoyed the Violette level of the Diffords recipe, but the sourness was too low. The sourness and sweetness of the modified recipe are right where I wanted them, but the Violette was a touch low. A simple combination of the recipes leads to the Cocktail Hacker Aviation. This recipe produces a cocktail that has a nice level of both sweet and sour. The Maraschino is present but the Violette becomes the background star. The Aviation is an amazing cocktail with or without the Creme de Violette. However, if you can find a bottle of Violette it will bring this cocktail to a new level of flavor complexity. The added floral aroma and flavor are amazing, not to mention the color the Violette brings. If you can’t find Violette at your local liquor stores turn to the internet, there are a few suppliers that can get you a bottle, for a price of course. Really enjoyed this page (and others) – I like the spirit of experimentation and finding a recipe that works for you. I’m about to start similar experimenting with an Aviation, but from a different direction. I don’t like accumulating lots of rarely used liquors like Creme de Violette, but I do like experimenting with non-alcoholic flavorings (such as flavored syrups and bitters) that I can use in things other than cocktails. So in a reverse to your Violet Fizz example, I have a bottle of Monin Violet Syrup and my challenge is to substitute with that to make an Aviation. Wish me luck. Awesome idea, Martin! Tinctures and syrups can give you a ton of flavors with a small amount of ingredient.